I have a serious case of salad envy. Every day my Instagram feed is flooded with gorgeous photos of amazing salads overloaded with mouth-watering ingredients. That type of food is hard to create when working with a strict budget because A) the more ingredients you have to buy, the higher your bill will be and B) pretty ingredients are often expensive ingredients. BUT today I did it. 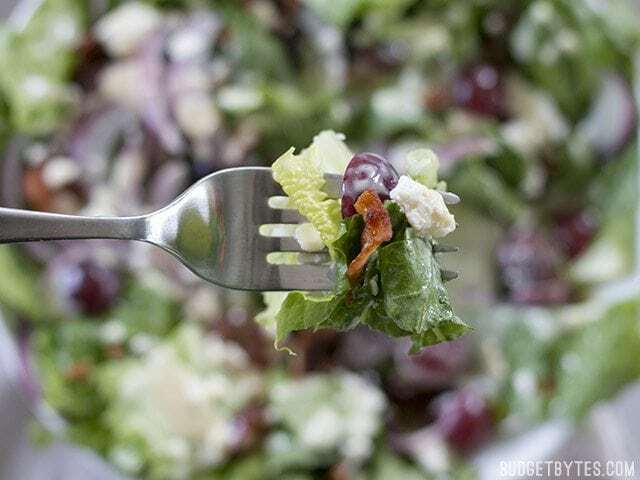 I broke down the “delicious salad” formula to its bare bones and used leftover ingredients from my fridge and freezer to make this delicious Grape Feta and Bacon Salad with Creamy Dijon Dressing. So what is this “delicious salad” formula? It’s easy: Base + sweet + salty + crunchy + creamy. As long as you have those five things you’ve got a pretty rockin’ salad. Here’s what I plugged into the formula: romain (base) + grapes (sweet) + feta/bacon (salty) + bacon (crunch) + feta/dijon dressing (creamy). As you can see, sometimes an ingredient can cover two categories and sometimes two ingredients share a category. No problem. As long as you have those flavors and textures covered, you’re good. Want to add more to make it a bit more filling and meal-worthy? Add a sliced chicken breast or a scoop of cooked grains like bulgar, couscous, or quinoa. 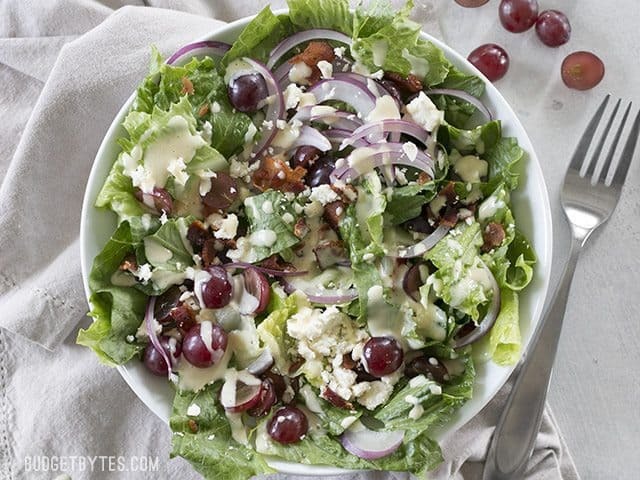 This Grape Feta and Bacon Salad with Creamy Dijon Dressing uses a simple formula to make a "gourmet" salad both easy and affordable. Prepare the dressing by whisking together the mayonnaise, vinegar, honey, Dijon, salt, and some freshly cracked pepper (about 10 cranks of a pepper mill). Refrigerate the dressing until ready to use. Slice the bacon into one-inch pieces. Cook the bacon in a skillet over medium heat until brown and crispy. 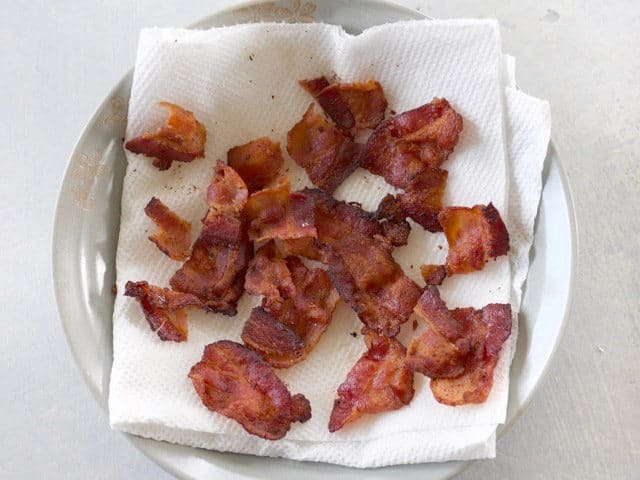 Transfer the bacon to a paper towel lined plate to drain. Chop the lettuce into bite-sized pieces, then rinse with cool water in a colander. Allow the lettuce to drain while you prepare the rest of the toppings. Thinly slice the red onion. Slice the grapes in half. Crumble the feta. 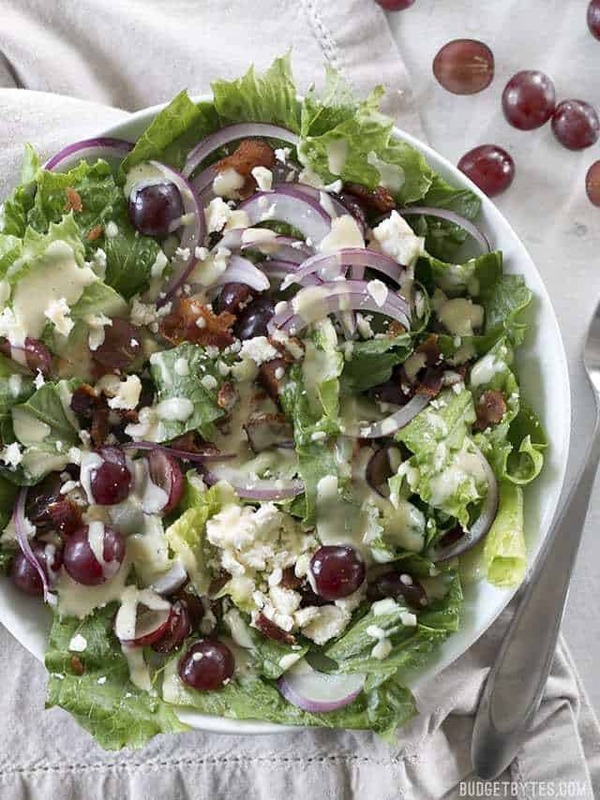 To build the salads, divide the lettuce between four bowls and top each with grapes, sliced onion, bacon pieces, and crumbled feta. Drizzle the creamy Dijon dressing over top, then enjoy. Prepare the dressing first. 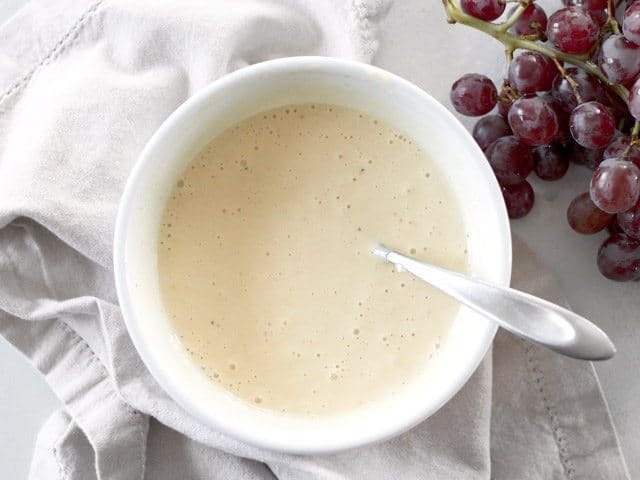 In a medium bowl, whisk together 1/2 cup mayonnaise (I used light mayo), 3 Tbsp apple cider vinegar, 2 Tbsp honey, 1 Tbsp Dijon mustard, 1/4 tsp salt, and some freshly cracked pepper (about 10 cranks of a pepper mill). Refrigerate the dressing until you’re ready to serve the salad. Because bacon is so highly flavored, I often use just a little bit in a recipe. So, when I buy a 12oz. 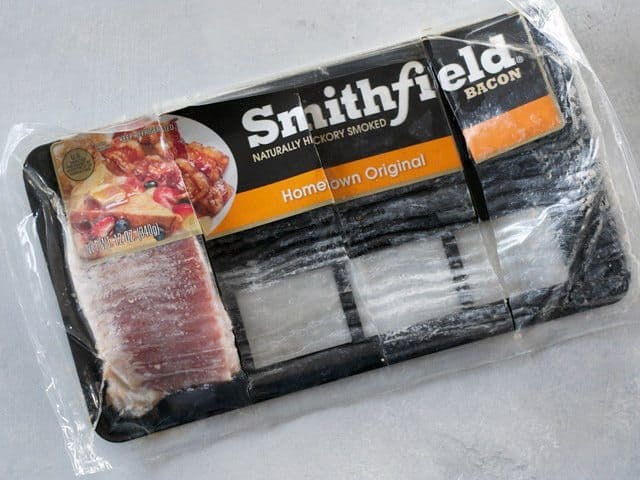 package of bacon, I cut the package across the slices into four equal parts and then freeze it (in a freezer bag). That way I can take out one 3oz. piece at a time to use in a recipe. I had one section left that needed to be used, so I took advantage of it for this salad. Cut the bacon into one-inch pieces, then cook in a skillet over medium heat until brown and crispy. Let the cooked bacon drain on a paper towel lined plate until ready to use. 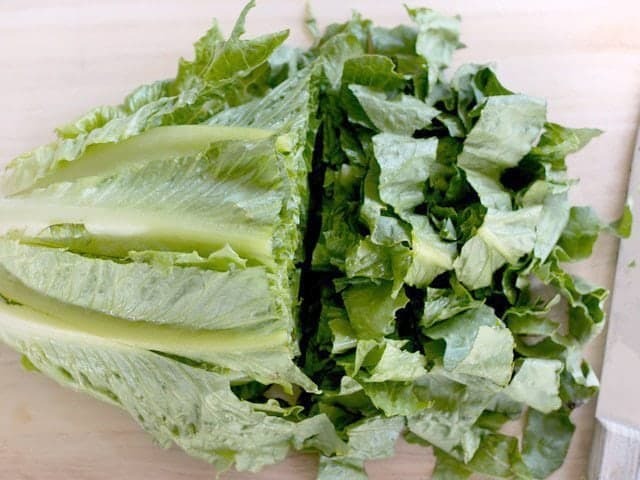 Chop the lettuce into bite-sized pieces, then wash it well in a colander. Let the lettuce drain while you prepare the rest of the ingredients. Thinly slice 1/4 of a red onion. Slice 1 cup of red seedless grapes in half. Crumbled about 2 oz. of feta. 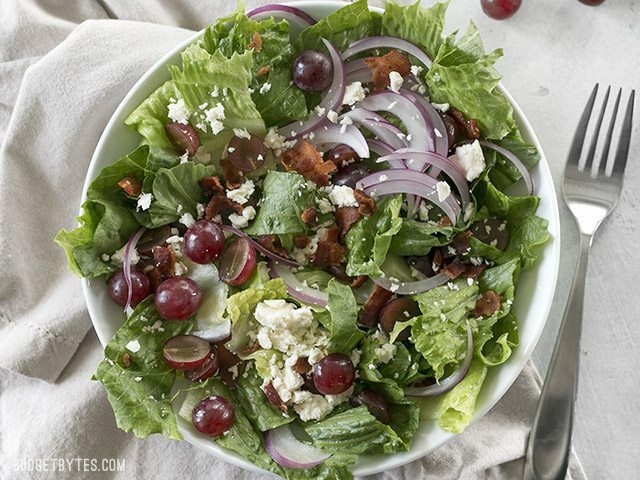 When you’re ready to build the Grape Feta and Bacon Salads, divide the lettuce between four bowls, then top with sliced onion, grapes, bacon, and feta. 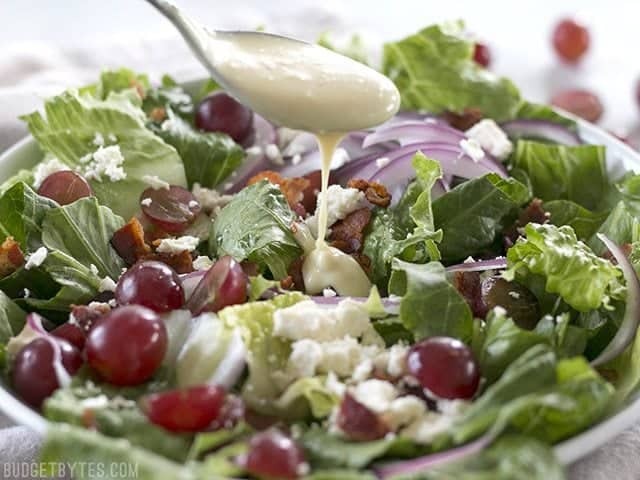 Then drizzle that delicious creamy Dijon dressing over the salad. Then take a pretty picture to post on Instagram. ;) Salad envy no more. Beth: This salad is amazing! And the dressing- whoa! I’m going to use it as a marinade too. Out of the ballpark here. Yum! Great and unusual combination, and perfect for a weeknight supper. Thanks for the recipe. How well does this one keep in the fridge? I would not eat four salads in less than four days. This is delicious! 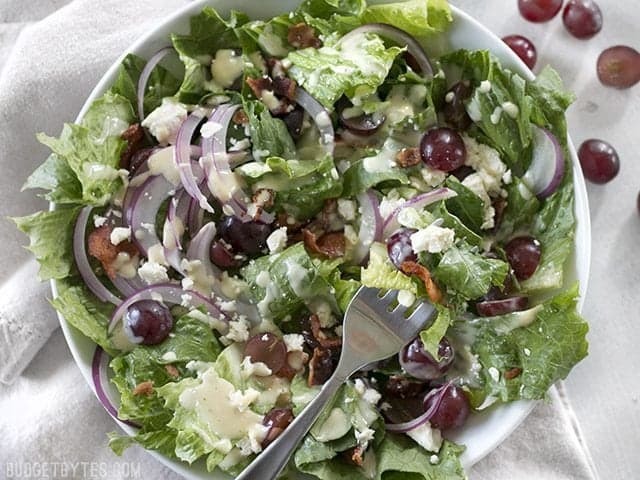 A great combination of flavors in the salad, and the dressing is superb. Thanks for a fabulous salad Beth! This salad was phenomenal. I wish I had made only that for dinner instead of making it a side. The dressing was perfect and I plan to use that on many other things. When I try a new recipe, Budget Bytes never disappoints! Might be a silly question, but did you cook the bacon from frozen or was it thawed? Since it was such a small piece, I just tossed it in the skillet frozen. I made sure to move it around a lot and flip it frequently so that it would thaw and break apart into the strips quickly. Feta is one of those things actually worth getting in one of those budget warehouse chains. It is seriously pricey in my local supermarkets, and if you know of a Middle Eastern grocery, you can get real buys there–my most fave being the mildly flavored Bulgarian goat feta. But back to the warehouse stores–a big block of several pounds usually costs under $10, and you can keep it a really long time–several months, in my fridge–if you make sure it is covered with water and change that water every 3-5 days. When I buy tht much, though, I usually share some of it with my DIL. A bit of upkeep for sure, but you will find lots of ways to use it beyond salads. I like to sprinkle some crumbled bits on pizza, and it is a great sub for Mexican white cheeses on tacos and enchiladas. LOVE that simple dressing!!! I love how you’ve given us enough recipes to use up all of that red onion. Yummy, Beth! Everything I like in one bowl. 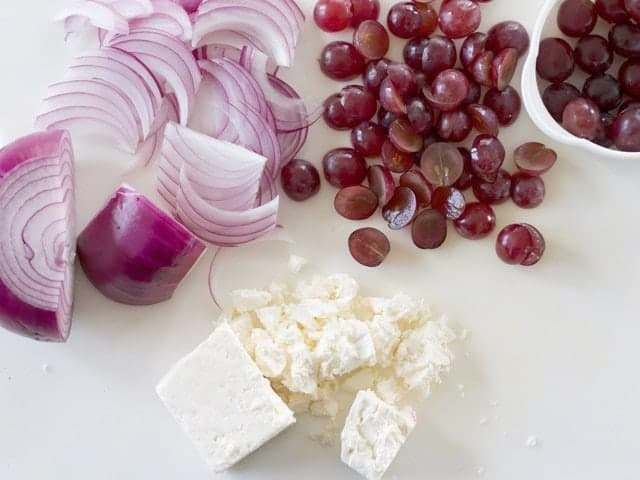 Feta, bacon, and grapes sound like a great combination now that I think about it, I never would have put those flavors together on my own.